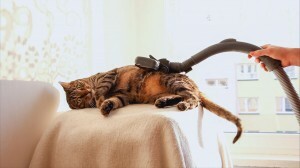 Bobo gets his fur ‘done’ and enjoys a relaxing massage at the vacuum cleaner spa, while helping Dad to test out two new attachments. Bobo is well known to love the vacuum cleaner and a few videos of him being vac’d have gone viral. He is testing 2 new attachements for the first time (“combination floor nozzle” – big and “crevice tool” – small, narrow) and enjoying being vacuumed with the “soft dusting brush”. I didn’t see this brand before in market. Could please share more details about this brand…? I am highly interested about this vacuum.